1827 FREE entire from London to Shrewsbury showing a very fine two-line ABOVE/NUMBER in Red, L 827. 1804 Entire from Bath addressed to Whitehall Palace, London. Sent as a 'FREE' but was above the Privilege Number. On arrival in London, a straight line 'ABOVE PRIVILEGE' has been applied and charged 2/4, L 820b. 1811 FREE Entire from London to Rochdale headed "JOHN'S COFFEE HOUSE". Circa 1770 FREE cover addressed to the "NEW EXCHANGE COFFEE HOUSE, LONDON". 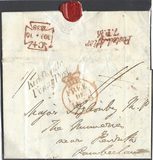 1828 "Returned paid Letter" cover to Wimbledon endorsed "FREE/FREELING" and showing To be/delivered/Free, L 715. There are pencil sketches of cats and dogs inside. 2nd JAN 1840 O.H.M.S. "Office of Woods, &C." 'FREE' COVER USED IN THE UNIFORM 4d PERIOD and addressed to Brighton. Showing a "♔ FREE" circular datestamp, Code E.
1793 FREE Entire addressed to Dumfries showing a fine London circular-framed 'FREE/P' datestamp, L 776e. 1799 FREE Entire to Pettenweem from London showing a FINE "♔/DE 13/99/xFREEx", L 788. RARE - IN USE A LITTLE OVER TWO MONTHS. Also showing on the front a fine DE/16 Edinburgh Bishop mark. 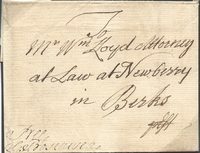 1779 FREE Entire addressed to Wakefield showing a fine circular-framed FREE, L767. 1795 FREE Entire to Felbridge Hall, Aylsham, Norfolk showing a fine London FREE datestamp, Code 'P', L 776a. 1772 FREE Entire from London to Edinburgh showing a fine circular-framed FREE in red, L 767, 21 mm, "P. Free Cust." and showing on the reverse London 26/AV and 27/AV Bishop marks. 1832 FREE envelope to Cambridge franked "Palmerston", who was Prime Minister at the age of 71 and again aged 75, showing on the front a fine "♔ FREE" circular datestamp. 1790 FREE cover from Dublin to Harlestone, Norfolk, via London showing a very fine circular-framed 'FREE/P' in black, L 772c. 1803 Free Entire to Doncaster showing a fine circular dated Crown/FREE 1803 datestamp, L794. 1785 FREE Cover to London franked by the Bishop of Wells "FRANK: BATH & WELLS" showing WELLS/S.123 first-type mileage, SO 911, early use. 1799 FREE cover from LONDON to GUERNSEY which is an ILLEGAL USE OF THE FREE FRANKING PRIVILEGE as the Franking Privilege did not extend to the Channel Isles - they were independent of the English Parliament. RARE.